This web map shows a wildfire's location and nearby fire fighting resources in Georgia. Redlands, CaliforniaA burn permit tracking system, developed by Esri for Georgia Forestry Commission, provides real-time information to landowners for permit issuance and reduces wildfire risks during prescribed burns. "Controlled fires benefit the forest," said Alan Dozier, Georgia Forestry Commission's chief of forest protection. "The Esri web solution manages digitized burn permit data, provides real-time maps of permitted burning, and helps us perform spatial analysis. This is necessary for effective smoke and fire management planning." 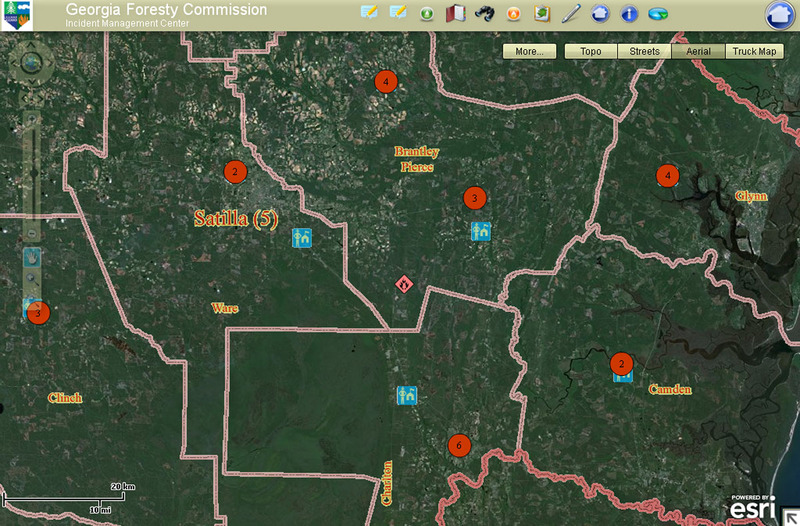 Georgia Forestry Commission has used Esri technology for many years as a tool for forest management and to fight forest fires. The development of the burn permit system will greatly expand the commission's use of geographic information systems (GIS). This GIS tool is the first of its kind. It shows the commission's current fire activity as well as how many acres have been burned within the entire state. The burn permit tracking system's GIS web tools allow users to easily add the location of wildfire events and manage the deployment of staff and fire suppression resources for forest fire management. "Georgia Forestry Commission's burn permit tracking system demonstrates how enhanced web mapping is being used to significantly improve the delivery of services to landowners while making the process easier to ensure environmental compliance," notes Peter Eredics, Esri's forest industry manager. "This system will also improve response time during wildfire events, which will result in fewer losses and safer working conditions for field crews." The system is built on Esri's ArcGIS Server architecture using the Flex Application Programming Interface (API). Georgia Forestry Commission is a dynamic state agency responsible for providing leadership, service, and education in the protection and conservation of Georgia's forest resources. The commission's central office is located in Dry Branch, Georgia. Visit gfc.state.ga.us.